Signed up for Twitter and explored how to use it to engage with others to extend my PLN. Engaged with people who, and groups that, align with my professional interests. Listed some activities that I can engage in to cultivate and expand my PLN. Blogged about “Extending Your PLN”. Mapped my PLN and posted it to my Domain. 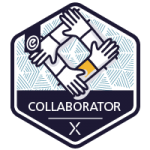 Apply for your Collaborator Badge!